I want to tell you about this brand that I have learnt a lot about recently. It’s natural skin care that works, and I can say that from personal experience. It is an all natural product. They also do have some organic certified products which I believe are the best product. I first started using one of their products about a month ago and I must say, It really does what it says on the bottle. So allow me to introduce you to TRILOGY. Before I start, I would like to mention that this is not a paid advertising article nor am I being paid to write about them. It’s just that I want you to know that natural stuff does work; fast and effectively. Trilogy is a brand that was created by two sisters. One was an accountant and the other had my dream job. She was a Beauty Journalist. They used to sell Organic Rosehip Oil to major companies and decided to do their own thing with the Rosehip oil. Their motto is ‘Maximum effect on the skin, minimum effect on the environment’. They are very environmentally friendly like that. Here is what they created. They practice ethical trade practices, have recyclable packaging, are against animal testing and NON GMO as well have contain natural fragrances and colours. So now that that’s all cleared up. Lets get to the good stuff. The products. I am not going to talk about them all in detail. Only one for now and I will talk about the others in future posts. The whole brand revolves around this product. ROSEHIP OIL!! Certified Organic Rosehip Oil is a 100% natural plant oil. 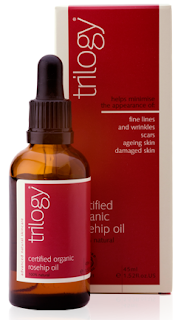 Trilogy Certified Organic Rosehip Oil is a powerful skincare product that helps improve the appearance of scars, stretch marks and wrinkles and dry skin. Its potent natural actives and 100% natural formula also make it highly effective for other skin concerns including ageing skin, dehydration and uneven skin tone. All skin types will benefit from the essential properties, even oily skins as oil battles oil. Here is where you learn something new. The oil is also rich in antioxidants, Beta-carotene and Lycopene which fight free radical damage and help preserve skin cell structure. These are key nutrients for keeping skin healthy and protected against the harmful effects of the sun and lifestyle stresses. This product will not block your pores. It can be used on all areas of skin on the face and body except areas of broken skin that have not yet healed. It is suitable for pregnant women and even babies. It is even used as an aftershave. It is truly wonderful. I strongly recommend this to everybody I come across and also their spin off product which is a surprise that will be posted very soon. To Buy: It’s a must have. Oh!! product sounds Great. This is really good for dry skin because this oil is natural and it is not harmful for skin. I love natural products. I think it really is a great alternative to all the beauty products we see in the drugstores. This is something I hope many will realize that this really helps.